It's Christmas Eve in L.A. and Corinne, Chris, Sarah, and Tim discuss the most exciting office Christmas party ever by watching that explosive yuletide classic Die Hard. Warning: Contains explicit language, spoilers, sugar-enriched flour, partially-hydrogenated vegetable oil, polysorbate 60, and yellow dye No. 5. Want to debate which candy bar makes for the best pre-shoot-out snack? Have a theory utilizing theoretical physics to explain how you fit an ambulance into a cargo truck? Are you alone, tired, and haven't heard diddly-squat about the things you feel we should have discussed? Leave a comment below and keep the discussion going. I saw this as a Boston College freshman, walking down from campus to the Circle Cinema, now demolished. I left feeling utterly exhilarated. The energy of Die Hard is rarely matched. Speed and Terminator 2 are among its exalted peers. I remember the Circle Cinema. I saw Volcano and Extreme Measures there, in that period where I would go to see pretty much anything. Not a bad place though I heard in later years they had a bit of a rat problem. I didn't see this on the big screen until many years later. 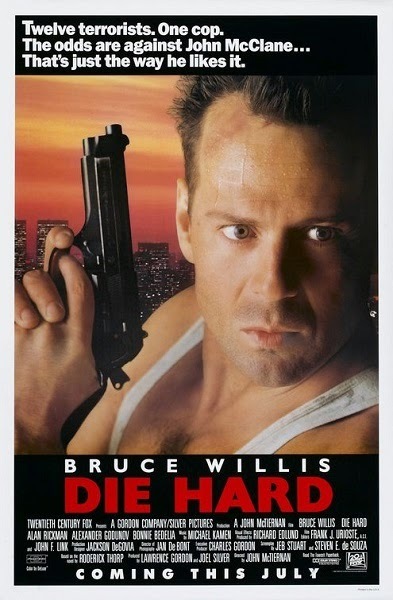 I can't imagine how incredible this must have been on first run, before every action movie became "Die Hard on a something." It has an elegance and simplicity and a sense of fun that seems sadly rare in the genre now.